Agriculture contributes over 45% to the net state domestic product. It is the main source of income and employment in Himachal. Over 93% of the population in Himachal depend directly upon agriculture which provides direct employment to 71% of its people. However agriculture in the state suffers from certain limitations, specially in the production of food grains. One of the reason is that the area under cultivation cannot be extended to any appreciable extent. Reclamation of land on slopes of hills for cultivation of food grains is neither economical nor beneficial. The farmers can profit more by raising cash crops suited to the agro-climatic conditions. Another reason is that reclamation of land from the hills increases the menace of soil erosion. The main cereals grown are wheat, maize, rice and barley. Kangra, Mandi district and to some extent Paonta valley of Sirmur district are the major producers of the 1st three cereals, while barley is mostly grown in Shimla district. Although the state is deficit in food grains, it has gained tremendously in other spheres of agricultural production such as seed-potato, ginger, vegetables, vegetable seeds, mushrooms, chicory seeds, hops, olives and fig especially vegetables and seed potato which is disease free and good quality are providing a good source of income to the farmers. Seed-potato is mostly grown in Shimla, Kulu and Lahaul areas. Fruit cultivation is another field which has proved to be an economic boon to the farmers. 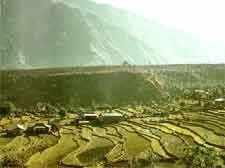 There are vast tracts of land in Himachal suitable only for growing fruits. Fruit cultivation does not add to the problem of soil erosion and its employment potential is much more than that of conventional farming. The yield pre acre in terms of money is also much higher. Apples yield the maximum income. Fruit growing in Himachal is presently fetching over Rs.300 crore annually. Special efforts are being made to promote cultivation of new crops like olives, figs, hops, mushrooms, flowers, pistachio nuts, sarda melon and saffron. Himachal has earned the name of the 'Apple State of India'. The agrarian reforms undertaken in the state by the government has also helped a great deal in the advancement in agriculture. In 1954, a revolutionary land reforms legislation, the Himachal Pradesh (H.P) Abolition of Big Landed Estates and Land Reforms Act was enacted. This Act took away land beyond a certain limit from big landlords and erstwhile rulers and transferred these to tenants on payment of compensation amounting to 24 times of the land revenue paid on the land. In 1972, the H.P ceiling on hand Holding Act was passed which had the land ceiling fixed on various kinds of lands and tenants could not be evicted. It also directed that every agricultural family must be given at least five bighas of land. As a result of these measures, 2500 big landed estates were abolished and as area of about one lakh acres was declared surplus and distributed to the landless. In 1974, H.P Village Common Land Vestment and Utilization Act was passed to enable the government, to give sham let lands to the landless. Under these aggression reforms, out of about 5 lakh agricultural families, about 4.5 lakh families have become land owners. The main sources of irrigation are Kuhls (small water channels) fed from perennial or seasonal springs. Well irrigation is possible in some areas near the plains. Lift irrigation is another source of irrigation. Efforts have been made to improve irrigation facilities since the beginning of the five year plans and about 1.60 lakh hectares have been provided with it so far. Availability of cheap credit, organization of marketing facilities and provision of agricultural inputs are very important for the development of agriculture. Besides governmental agencies, co-operative societies are the only agencies which performs some of these functions. Co-operative societies numbering around 3841, cover about 93% of rural population. Some agricultural societies provide short and medium term credit facilities to their members. Other functions of the co-operatives, is the mobilization of deposits and the marketing of agricultural and horticultural produce. They also play a vital role in the public distribution system and are running a lot of fair piece shops in the state.